In contrast to the first match, our second league match of the season took place on 11th November at Nonsuch Park (Ewell) in wet and chilly conditions. Recent rain had left the course very muddy, making the gently undulating 2-lap 6K senior course more challenging than on previous visits. 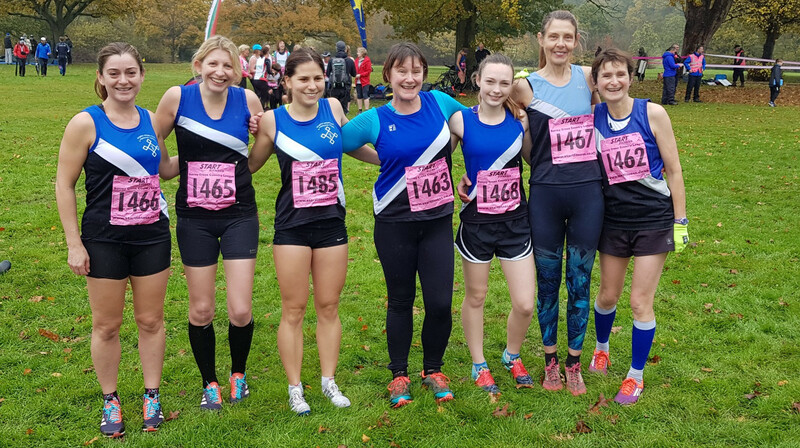 K&P were delighted to welcome a new member to the team - Daniela Jantschy - who had a fine run, leading the team home in 9th place in Division 2 in a time of 24:11. Continuing her fantastic start to the senior league, Rebecca Keddie showed improved form to finish in 28th place (26:04). Nina White also had a very good run, finishing not far behind in 26:58 for 41st place. Nicky Atkins and Nicki Murphy had a close battle, with Nicky A finishing strongly in 85th place (29:11) and Nicki M chasing hard to complete the scoring ‘A’ team in 97th place (29:44). Liz Richardson continued to improve in her return to fitness in 128th place (31:10) and Caroline Jeffcote, returning to shorter distances after her recent marathon debut, completed the team effort with a strong sprint to finish in 256thth place (39:50). The team finished in 8th place on the day, a fantastic result in a very strong field of 269 Division 2 athletes, well done to all. The Surrey County Championships will be held on Sunday 7th January 2018 at Denbies Vineyard (Dorking) and our next league match will be on 13thJanuary at Wimbledon Common. Any athlete interested in joining the team and running at either of these events should please contact Liz Richardson.